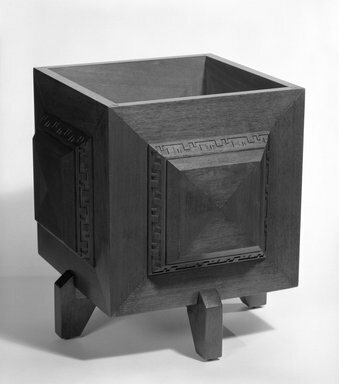 Planter, mahogany, square shape with open top raised on four feet (in center of each side). Large, raised decorative panel on center of each side. CONDITION: generally good with some minor scuffs to surface (most noticeable along one of top edges). Some diagonal joints on surface are not quite flush but strong. Some build up of varnish (?) at seams, especially around decorative panels.